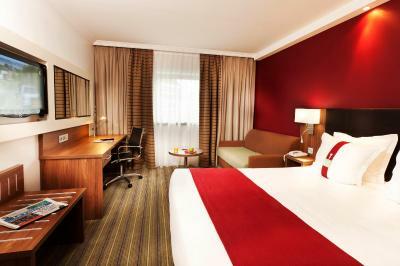 Lock in a great price for Holiday Inn Paris Marne-La-Vallée – rated 8 by recent guests! The Staff was professional, polite, and extremely friendly. The location was near a metro station. The hotel is clean. The staff at the reception are nice too. Breakfast was superb. Family friendly hotel too. Very convenient location right next to RER, Arcadia mall and a few restaurants. The breakfasts are good. The staff working in this hotel made everything easy for us. They where great!!! Located in Noisy Le Grand, just a 20-minute drive from the center of Paris and Disneyland Paris, this hotel offers modern rooms with Wi-Fi access. It features a fitness room and guests are invited to enjoy a drink in the on-site bar. With a flat-screen TV and satellite channels, all of the air-conditioned rooms include tea and coffee making facilities and a mini-bar. The private bathrooms are equipped with hairdryers. Connecting rooms are available upon request. Secure, private parking is possible and the hotel is 650 feet from the Noisy-le-Grand Mont d’Est RER Station and a 15-minute drive from Val d’Europe shopping center. Exit 8 of the A4 motorway is just 1,950 feet from the hotel. 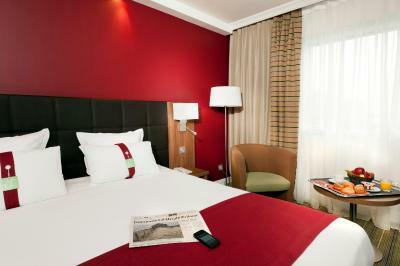 When would you like to stay at Holiday Inn Paris Marne-La-Vallée? A mini-bar and a flat-screen TV with satellite channels feature in this air-conditioned room. Please note that the bed configuration will be allocated upon arrival, based on availability. 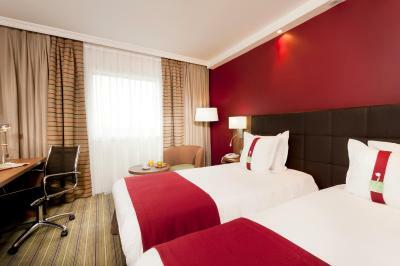 A minibar and a flat-screen TV with satellite channels feature in this air-conditioned room. A minibar and flat-screen TV are provided in this heated room with city views. The private bathroom has a bathrobe. This family room has a mini-bar, electric kettle and air conditioning. Build with an elegant and modern architecture the hotel Holiday Inn Paris – Marne la Vallée will provide you a memorable stay between Paris and Disneyland Paris. Spacious and sophisticated this hotel will delight you with is 192 fully renovated rooms created in the same edifice of a commercial center, you will easily take advantage of an afternoon of relaxation between shopping, movie theatre and perhaps finish with a diner in one of the thematic restaurant of the mall. Moreover, the hotel has a special/unique way of child welcoming. Indeed, what is more pleasant than travelling with all of his family included the toddlers and gets a free stay and a free meal every evening for them? The Holiday Inn Paris – Marne la Vallée provides it! House Rules Holiday Inn Paris Marne-La-Vallée takes special requests – add in the next step! Holiday Inn Paris Marne-La-Vallée accepts these cards and reserves the right to temporarily hold an amount prior to arrival. Room area is little less. But its OK. Very nice staff. Very good breakfast. WC and Bathroom separate. Easy access to Disneyland. Everything. Entirely woeful experience, unlike anything I have ever experienced in my life. We had booked a room with a balcony. It turned out that the square in front of our room was being dug up and there were workers with a lot of noise. We were not aware of this situation until we arrived. The stay from us was 5 days with breakfast and it would have been better if they could do different varieties each day of food instead of having every day the same. On some of the days we had to wait log for the food to be filled up and it was just 9:00 o clock. The breakfast was a bit basic and I have had much better for the cost previously. It was modern and the location was ideal for using local transport links. Small rooms. Restaurant staff not friendly, except for Martina. Her customer service skills were amazing! We ran out of bathroom tissue and towels and the hotel staff took forever to replace them. The property location was great. It is located next to a mall for great shopping and the train station. Nothing was bad or “disliked”..
its location being one of its major advantages is also its main drawback due to the inconvenience caused by the RER trains operating nearby (disturbed early in the morning by train noise). Nice comfy hotel, excellent location (RER station opposite the hotel) and premises conveniently located in between central Paris and Disneyland (both reachable within 20 minutes via the RER service). Great breakfast and helpful staff. There were some tiles broken in the bathroom and the bath had a small crack. No air conditioning and the room was hot. Not sure if you had to pay extra for it but it didn't work. Extra taxes for local had to be paid on leaving, not sure why this isn't included in the booking and room fee. Breakfast was good, room was comfortable and hotel was close to train station and shopping centre underneath. Some of the staff are so short temper, not willing to help , they throw responsibilities on other. Even they do not have social smiles. The restaurant was miserable. Just have a look on the plates and dishes. They are not clean at all. Sorry to say that food traces from previous customers were left in the dishes and cups were dirty. In addition the receptionist told me that I paid for every thing and nothing more is needed. I left the hotel and took a taxi, then my bank sent me a message mentioning that the hotel just drew more 46 euros from my visa. What is this? Well the rooms are a little dated, the shower had to pressure. The garage is like some place from a horror movie. Too expensive regarding the atmosphere. The breakfast was fine and the supper as well. They have a good restaurant. I didn’t like that I couldn’t open window for the fresh air, but I understand it was a safety measure. I really enjoyed breakfast. It was all fresh, very filling and lots to choose from. Staff was very nice, friendly and polite. Room was clean and comfy. Hotel is next to the shopping centre and in very close distance to all the public transport, which we found very helpful.